But the builder's show says it will not hold future events in Utah. PORTLAND, Ore. (BRAIN) — Next month's North American Handmade Bicycle Show in Salt Lake City will go ahead as planned despite the recent controversy over land use policies in Utah. However, organizers said they will not plan future shows in the state, and would have moved this year's show if there had been time. SANDY, Utah (BRAIN) — Reynolds Cycling is raising money for the Huntsman Cancer Foundation and the work of the Huntsman Cancer Institute by hosting a fundraising raffle that has already started and will conclude at the 2017 North American Handmade Bicycle Show on Sunday, March 12. Next Handmade Show is in Salt Lake City in March. SALT LAKE CITY, Utah (BRAIN) — Tickets are now on sale for the general public to attend the next edition of the North American Handmade Bicycle Show, which is being held here March 10-12, 2017. BOULDER, Colo. (BRAIN) — The Pro's Closet will attend next year's North American Handmade Bicycle Show in Salt Lake City, giving consumers attending the show a chance to trade in their old bike for a voucher to put toward a new custom bike. SALT LAKE CITY (BRAIN) — The North American Handmade Bicycle Show has opened registration for new exhibitors. The thirteenth edition of NAHBS will be held next year in Salt Lake City, March 10-12. Applications for new exhibitors are now being accepted. 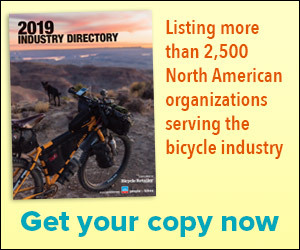 SACRAMENTO, Calif. (BRAIN) — The North American Hand Built Bicycle Showhas appointed Echos Communications as its agency of record for the 2017 show. NAHBS also retained SJE Productions for show management, client/sponsorship relations and strategic direction. BOULDER, Colo.­ (BRAIN) — The North American Handmade Bicycle Show (NAHBS) wrapped up one of its largest shows at the Sacramento Convention Center, with among the highest number of exhibitors and crowds. SACRAMENTO, Calif. (BRAIN) — This year’s North American Handmade Bicycle Show proved the old adage: If people don't have to fight 18 inches of snow, they will come. SACRAMENTO, Calif. (BRAIN) — The 12th annual North American Handmade Bicycle Show opened Friday at the Sacramento Convention Center and runs through Sunday. The show has more than 150 exhibitors and organizers expect attendance to exceed the record set the last time the show was in Sacramento, in 2012. BOULDER, Colo. (BRAIN) — Nelson Vails, the only African-American cyclist to win an Olympic medal, will preside over five screenings of a new film about his life, "Cheetah – The Nelson Vails Story," at the North American Handmade Bicycle Show this weekend. VALLEJO, Calif. (BRAIN) — The recent California Fatbike State Championships at Rim Nordic Ski Area saw Foes/Wren-equipped racers win four out of five events entered, and the two companies have decided to team up again at NAHBS. The show takes place in Sacramento, California, Feb. 26-28. BOULDER, Colo. (BRAIN) — Selle Anatomica will be the official saddle of this year's North American Handmade Bicycle Show, and will be building saddles at the show. The show is Feb. 26-28, at the Sacramento Convention Center in California. BOULDER, COLO. (BRAIN) — Organizers of the North American Handmade Bicycle Show will honor wheel innovator Steve Hed, who died last November, with a new annual award in his name.